Sydney Shop Girl: The Weeknight Book Club: Friday Nights by Joanna Trollope. The Weeknight Book Club: Friday Nights by Joanna Trollope. I apologize if it's rubbing salt into the wound of it only being the first day of the working week to be already talking about Friday Night. At least it's Monday night rather than Monday morning. 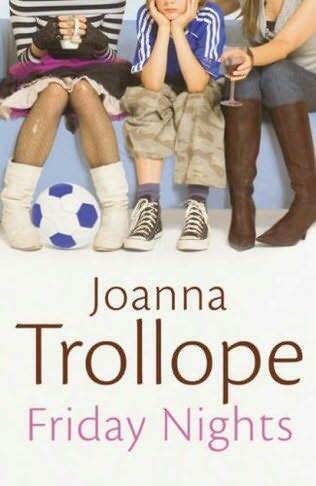 'Friday Nights' is the first Joanna Trollope novel that I've ever read. Kate, a regular reader of this blog kindly suggested her as an author for me explore in my journey of international chick lit. From my scan of wikipaedia, Joanna Trollope is an English novelist who is known for her novels about 'upmarket modern families'. She also writes historical novels under a pseudonym, Caroline Harvey. Friday nights are a time of respite (and escape). A time to catch up on that part of your life that occurs outside of work and the relentless grind of weekday responsibilities. Eleanor is an elderly woman who lives alone, having worked in her youth to provide herself with a retirement free of financial concerns. She has often looked out her front window on the sight of two younger women going about their usual business. They appear to be single mothers who have the overwhelming task of being mother, father and breadwinner for their respective children. Eleanor invites the women, Paula and Lindsay, to her home for a get together on the following Friday evening. After an unseasy start, the group grows to include other women whom Paula and Lindsay know. What starts out as a weekly girls night in and a study of contrasts of women from different generations soon gets a little more Desperate Housewives with the arrival of Jackson, a suave and wealthy man who becomes not only Paula's love interest but also a person of interest in the lives of all the other women. It doesn't take long for Jackson to turn Paula's life on its head. He gives her son a much need father figure to go to soccer games with, he causes tension between Paula and her ex partner. He makes advances to another lady in the group and makes some 'too good to be true' business proposals to others. There is a change in dynamic of the Friday night group. No longer are all the women happy or at least resigned to their lives and the constant support of each other. Single women now have lovers, married women question their relationships and Eleanor herself finds that age is finally clipping her wings. There is suspicion, jealousy and ultimately self analysis and realization. I enjoyed 'Friday Nights' as a novel that has an added diamension to others in this genre. There was a depth and development to Trollope's male characters that had me empathizing with them as well as the main female characters. I am linking here to this thoughtful review from The Guardian. Trollope really does write men well. For me, the female characters weren't as 'real and relatable' as those in the novels of my favourites (Cathy Kelly, Maeve Binchy and Marian Keyes). They seemed to be a little restrained and removed (coming from a person who doesn't like showing her emotions in public, I guess I like reading larger than life characters). I think this is probably Trollope's style of writing. Which I intend to get used to as I read more of her novels. Having said this, there were some quotes that are so true and real. I'll try not to give the plot away here as I quote. A conversation about not committing any further to the relationship. "I don't do this, babe. I don't do this regular-guy stuff." Paula, despite her best efforts felt her voice rise uncontrollably. "But we've got to move on," Paula cried. "We've been like this for months. Relationships don't stay the same, the can't they can't just go on.... "
Eleanor reflecting on how different the opportunities are for intelligent and well educated women in the 21st century from the time of her youth. "I was born at the end of what the tabloid press would regard as the golden age of female caring ..... when, because of the lack of educational and professional opportunities, the most brilliant women fave their talents for free in what might loosely be termed the caring sector. I was lucky to be born late enough to be paid." Sounds like a great recommendation. I haven't read any Joanna Trollope but am making my way through The Guernsey Literary and Potato Peel Pie Society. It's fantastic. Unputdownable. I really can't wait for the end so I can read it again. I've never really been one for chick lit but reading a review like this makes me curious. Sounds like an interesting read SSG. Miss Kitty-Cat I have been meaning to order that from Book Depository. Will do so now. I saw this in the Big W sale catalogue (I'm a junk mail junkie)- think I will pick it up as I'm waiting for new books to be written by Marian, Maeve and Cathy.